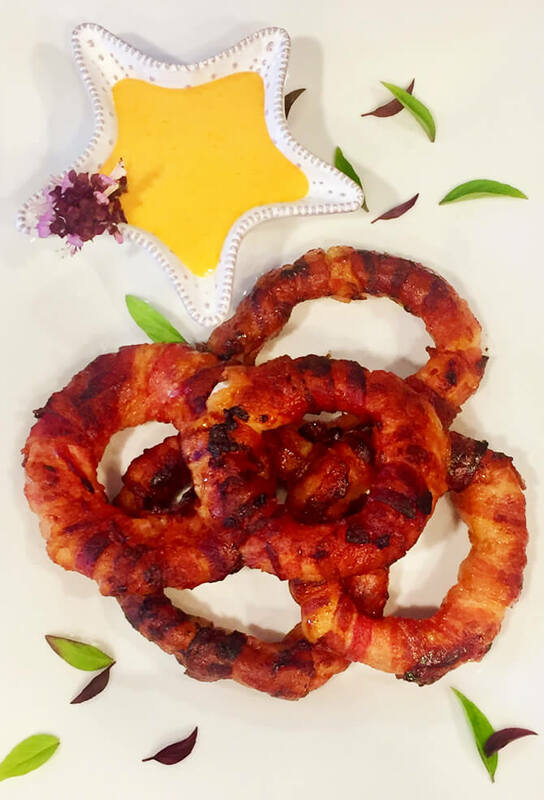 These indulgent, bacony, sweet and savory onion rings are out-of-this-world delicious! Slice the onions, with the skin on, into 1/2-inch slices. Carefully peel the skin and outer layer off each onion slice. Pop out 2 layers of onion rings at a time, discarding the center of the onion. Wrap a strip of bacon, overlapping, around each double onion ring and repeat with more bacon strips, until the onion ring is completely enrobed. Secure the end of the last strip of bacon with a toothpick. Repeat using the remaining onion rings and the bacon. Place the bacon-wrapped onion rings on a silicone baking mat-lined baking sheet or an aluminum foil-lined baking sheet. Brush the bacon-wrapped onions rings with maple syrup on both sides. Bake for 20 minutes, then turn the onion rings over and bake for 15 to 20 minutes more or until dark golden brown. To make the sauce, whisk together the mayonnaise, sour cream, hot sauce and lime juice. Serve the bacon-wrapped onion rings with the dipping sauce.